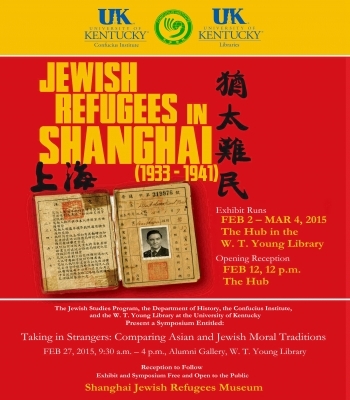 (Feb. 12, 2015) — An exhibition and symposium at the University of Kentucky will explore the experience of Jewish refugees in China. The traveling exhibit, "Jewish Refugees in Shanghai (1933-1941)," which is on display through March 4 in William T. Young Library, chronicles the story of thousands of European Jews who fled to China to escape Nazi persecution before and during World War II. An opening reception for this free public exhibition will be held noon today (Thursday), Feb. 12, at The Hub in Young Library. "It's a great opportunity for us to be able to host this historically significant exhibit," said Jeremy Popkin, the William T. Bryan Chair of History and faculty member of UK's Jewish Studies Program. Though living conditions in Shanghai were often severe, most of the refugees survived, and many went on to lead remarkable lives. "Jewish Refugees in Shanghai" brings together for the first time photos, personal stories and artifacts from Shanghai’s Jewish Refugee Museum and from former refugees now living in southern California to depict what Holocaust historian David Kranzler deemed the “Miracle of Shanghai." The exhibition is sure to shed light on a relatively unknown story from WWII. “The Jewish migration to Shanghai was a topic I knew nothing about. As my graduate assistant and I prepared this exhibit we became involved in the many stories and had to make hard choices on what to display. 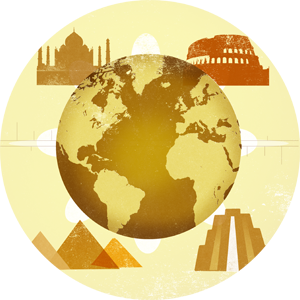 It is a remarkable story and University of Kentucky Libraries is pleased to be able to present this exhibition,” said Toni Greider, director of International Programs at UK Libraries. Huajing Maske, director of the UK Confucius Institute, is also excited to help bring this important exhibit to the Commonwealth. "The UK Confucius Institute is very proud to work with the W. T. Young Library to bring this extraordinary exhibition to UK’s campus. The topic of Jewish refugees in Shanghai during WWII is not widely known in the U.S. We hope to spur conversations on this interdisciplinary topic on campus and in the community." Select pieces of "Jewish Refugees in Shanghai" are on display in the Young Library Atrium, and the rest of the exhibit is displayed in Core 1 of The Hub at Young Library. The exhibition was brought in by the Confucius Institute and is being presented by UK Libraries. The exhibit was developed by University of California, Los Angeles (UCLA) Center for Jewish Studies, the UCLA Confucius Institute and Hillel at UCLA. In conjunction with the exhibition, UK Confucius Institute and UK Libraries have teamed up with UK's Jewish Studies Program and Department of History to present a symposium on this movement. "Taking in Strangers: Comparing Asian and Jewish Moral Traditions" looks at the sheltering of thousands of European Jewish refugees in Shanghai during the period of the Holocaust and provides an opportunity to consider traditions of obligation toward "strangers" in East Asia and compare them with Jewish thought and practice. "Taking in Strangers," which is free and open to the public, will run from 9:30 a.m. to 4 p.m. Friday, Feb. 27, at the UK Athletics Auditorium at Young Library. The symposium will feature a keynote address by Haiyan Lee, associate professor of Chinese and comparative literature at Stanford University and author of "The Stranger and the Chinese Moral Imagination." · Steve Hochstadt, professor of history at Illinois College and author of "Sources of the Holocaust" and "Exodus to Shanghai: Stories of Escape from the Third Reich." The symposium will end with a tour of the exhibition "Jewish Refugees in Shanghai" at 3:30 p.m. and a reception at 4 p.m.
"I hope faculty and students will find time to see the exhibition and participate in the symposium. Faculty and students who will join our teaching and study program in China will find it fascinating visiting the Jewish Refugees Museum in Shanghai where all the artifacts in this exhibition come from," Maske said.